Considered the premier location to view wild Orca (Killer) Whales, the waters around San Juan Island are ideal for Whale Watching. During peak season orcas are encountered on 90% or more of tours! Join us on the new and fast, 55ft vessel Sea Lion for a Naturalist Guided tour in one of the most unique marine ecosystems. The calm waters surrounding San Juan Island are also home to seals, sea lions, eagles, many marine birds, porpoise, humpback whales, and minke whales. With 3 US Coast Guard approved Whale Watch Vessels and departures throughout the day, there is sure to be a tour that fits your schedule. Tours are 3-4 hours long and depart just steps from the ferry terminal in Friday Harbor. Marine Naturalists will interpret wildlife sightings and Professional Captains will maneuver the boat for prime viewing. San Juan Safaris prides itself on delivering high quality tours with respectful wildlife viewing for a fun and educational experience. A small group setting (40 or fewer passengers), allows for more personal interactions with Naturalists and ample viewing space. There two easy, fast, and beautiful ways to arrive to San Juan Safaris. Drive the scenic by-way to Anacortes to board the ferry or fly directly from downtown Seattle. San Juan Island is accessed via the WA State Ferry that departs from Anacortes, WA – just 90 miles north of San Juan Island. The ferry route and drive are part of the Washington Scenic By-Way and worth a ride. The ferry meanders through the calm waters of the Salish Sea and surrounding islands before arriving just feet from our office in Friday Harbor. Ferries depart throughout the day for easy travel. Vehicle reservations are recommended on the ferry. Joining for the day? Walk on the ferry! Leave your car behind and be a foot passenger for quicker and more economic ferry travel. 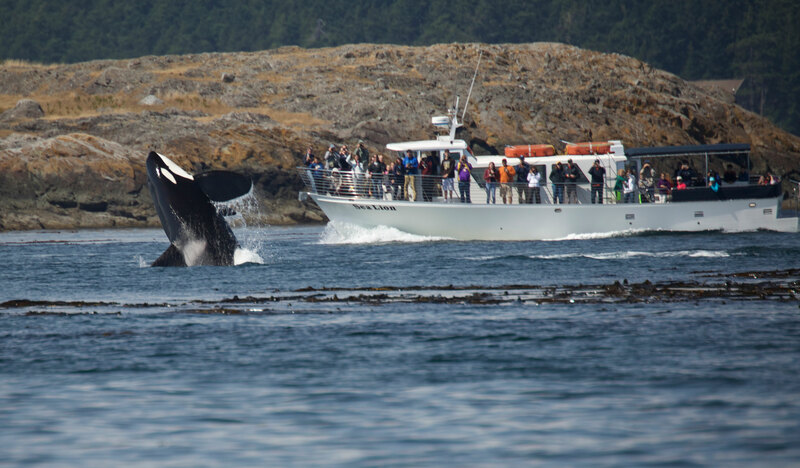 Jump aboard the Whale Plane for the easiest and quickest way to Whale Watch from San Juan Island. Kenmore Air operated float planes depart from Lake Union near downtown Seattle and land just 60 minutes later in the Friday Harbor Marina. The Kenmore docks in Friday Harbor are an easy walk to our office location. The scenic flight offers views of Seattle, Puget Sound, the Olympic Peninsula, the Cascades including Mt. Rainier and Mt. Baker, and the San Juans from above! The plane arrives in time to enjoy the town for Friday Harbor and its many shops and restaurants. Fly back to Seattle after the Whale Watch Tour or stay the night and return the next day! Roundtrip Air plus San Juan Safaris’ Whale Watch and Wildlife Tour is just $345/adult, $325/child, and free for children under 2! San Juan Island is accessed via the WA State Ferry that departs from Anacortes, WA – just 90 miles north of San Juan Island. Ferries depart throughout the day for easy travel. Vehicle reservations are recommended on the ferry. Joining for the day? Walk on the ferry! Leave your car behind and be a foot passenger for quicker and more economic ferry travel. What to Bring: Warm layers, camera, snacks, water, sunscreen, hat, sunglasses, and gloves if you get cold. What to Wear: Warm layers as it is cold while on the water, closed toed shoes, and long pants are recommended. Looking for a more private experience? Charter one of our 3 vessels starting at $895. "A-MAZ-ING!!! What a great experience! An awesome boat ride with friendly and educated hosts. We saw so many whales!!! It was the coolest day! Thank you to all the people who made it a great experience." "...it was a great experience and one I would highly recommend." "When I need a day of Zen and killer whales, it’s my fave thing to do. I highly recommend San Juan Safaris." Beautiful Evening full of whales and lighthouses!